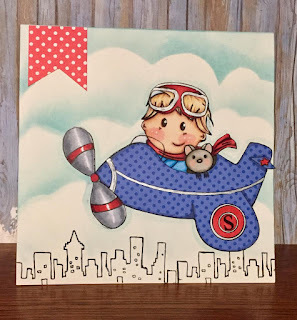 Hi friends, I'm posting today with a card using Shy in the Sky from Sasayaki Glitter Designs, I chose this image because our grandson will be turning 1 in a couple weeks and his daddy is a pilot, thought this would be perfect! Not that he will know, but I do and at this point.....that's good enough! 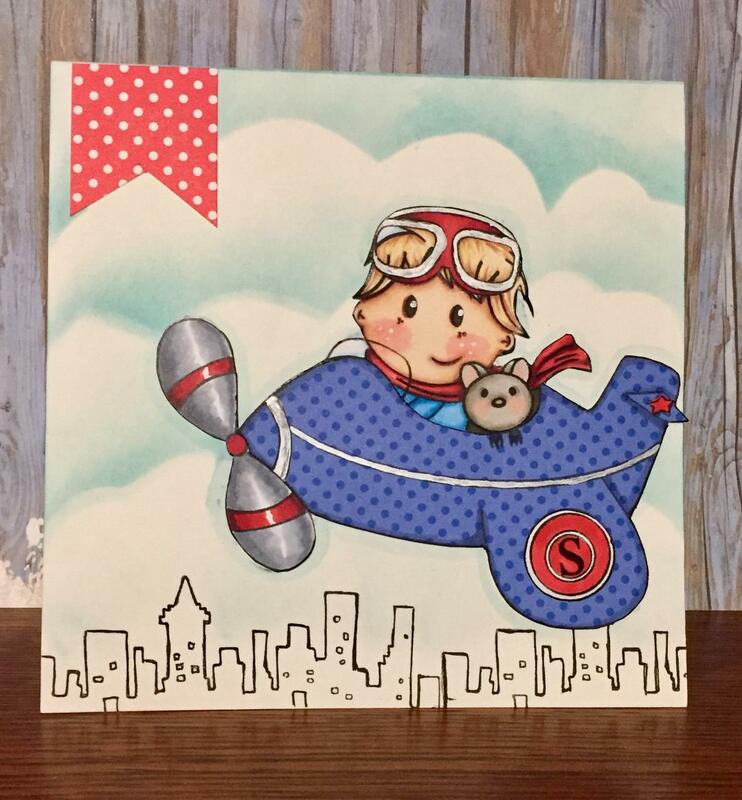 I paper pieced the airplane, used distress ink and a hand made cloud stencil for the sky, the cityscape is a stamp from Paperie Ink and I used a silver ink pen for the stripe on the plane. I tend to wait until I know for sure what occasion I want to use a card for before adding a sentiment, but I think Celebrate or Happy Birthday is going to go on the top somewhere. I hope you all have a great day, hop over to join a challenge or two at Sasayaki Challenge Blog or FB group! Lovely card - great paper piecing and wonderful sky. Thank you for sharing at Cardz 4 Guyz. So cute! Thanks for joining us at Craftaholics R Us. Cute card! Thank you for joining us at Cardz 4 Guyz. Sian. Love it! Great paper piecing and I love the sky backround you've created too. Thanks for joining us at the Crafty Catz Challenge.